Winter fun can be found from every direction! Santiam Pass and Willamette Pass are the main winter recreation areas for winter sports on the forest. Activities radiate from the sno-parks in each area. You can find cross-county ski trails, snowmobile trails, and places for sledding and snow play. Four campgrounds are open year-round: Shady Cove Campground on the Detroit Ranger District, Cougar Crossing Campground and Lookout Campground on the McKenzie River Ranger District, and to the south Indigo Springs Campground on Middle Fork Ranger District. Three rustic cabins are available to rent in the winter months: Warner Mountain Lookout and the Fish Lake Remount Depot Commissary Cabin and Hall House. There are also several winter shelters for use. Some of the shelters permit overnight stays; some are warming shelters only. Use our winter recreation map to help you find an area or find areas under each of the winter sports activities listed above. View tips and resources to help you plan and prepare for your trip to ensure the best possible time for you and others who will be sharing the snow with you. Oregon Sno-Parks: Tripcheck.com has an interactive map with a regional list of Sno-Parks and the activities available at or near each Sno-Park. The People’s Tree is a symbol of the combined efforts of common folks doing their jobs in service to their fellow citizens. 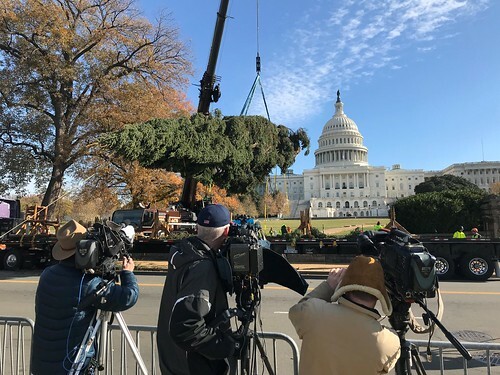 Hundreds of forest rangers, loggers, law enforcement officers, truck drivers, crane operators, restauranteurs, hotel staffs and school teachers from the State of Montana and across county made this gift possible. Many donated their time and effort free of charge, while others in the performance of their professional duties, worked longer hours, spent late nights and early mornings on the road for a month away from their homes and loved ones. This holiday season let’s spare a smile or a kind word to those who work in the service of others. Take a moment to remember that the blessings you enjoy and may take for granted are provided by men and women who take pride in giving you their very best. Can each of us do any less in return? Have a Merry, Merry Christmas.